I’m not much for mornings. I never have been. I’d just as soon have a good cup of Chai Butter Tea or homemade bone broth for breakfast, but one thing I do like is a bowl of yogurt topped with fruit and nuts. It’s easy to make. It’s light. It tastes lovely, and the combination of protein, fat and carbohydrate provides satiating energy. It takes about five minutes of active time in the kitchen, meaning that you’re able to eat wholesome, nourishing foods that don’t require a lot of time. 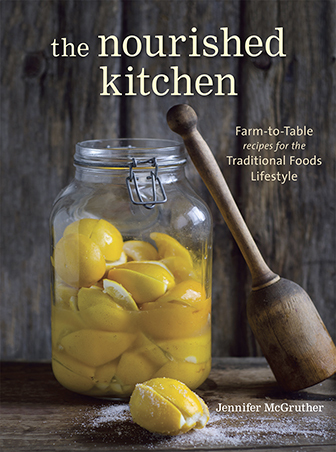 Most of the time, I make my own yogurt (you can find a few recipes in my book, The Nourished Kitchen, as well as in Yogurt: Sweet and Savory Recipes for Breakfast, Lunch and Dinner by Janet Fletcher), using fresh milk from a creamery down the road. They keep their Jersey cows on grass, which gives the milk (and my yogurt) a lovely flavor. The milk, cream and butter from cows kept on pasture, rather than in confined dairy operations, is richer in nutrients like vitamin A, vitamin E, beta-carotene and conjugated linoleic acid, a healthy fat with anticarcinogenic properties (read more here). Moreover, when cows are kept on grass, and managed holistically, they can help improve soil quality, the diversity of native flora and reverse desertification (read more here). Yogurt is also rich in beneficial bacteria. These bacteria eat up milk’s naturally occurring sugars, and convert them to beneficial lactic acid. It’s this conversion that turns milk from sweet to pleasantly sour. Yogurt also helps to improve gut health, and reduce inflammation and support the immune system (read more here). If you’re making your own yogurt, you can find a starter culture here. I make my yogurt in half gallon batches in my dehydrator (you can find a dehydrator here, but make sure to check out how to choose a dehydrator here). I look forward to strawberry season every year. Most of the strawberries in the supermarket, available year-round, are bred to come to market quickly, and to withstand long distance travel. As an exchange for these attributes, valued in the industrialized food model which demands extended shelf life to allow for transportation, strawberries lose their sweetness and their flavor. Older varieties of strawberries don’t last as long in the fridge and are too fragile to stand up against the bumps and rigors of long-distance travel, and they end up bruised and smashed too easily, but they are sweeter with more of that distinct, lovely, strawberry flavor. This is why the strawberries at your farmers market or farm stand likely taste that much better. Like most berries, strawberries are also rich in antioxidants, and offer anti-inflammatory properties. It’s these vitamins, minerals and antioxidants that help strawberries to detoxify free radicals and protect and repair DNA (read more here). Some researchers are looking into the role that strawberries and their antioxidants might play in combatting cancers, and colorectal cancer in particular (read about their work here and here). 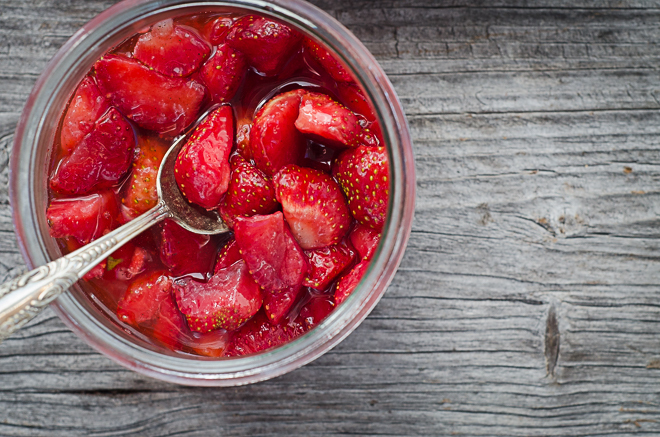 Macerating strawberries in honey and spices softens them, and helps them to form a thin syrup that blends beautifully with yogurt. 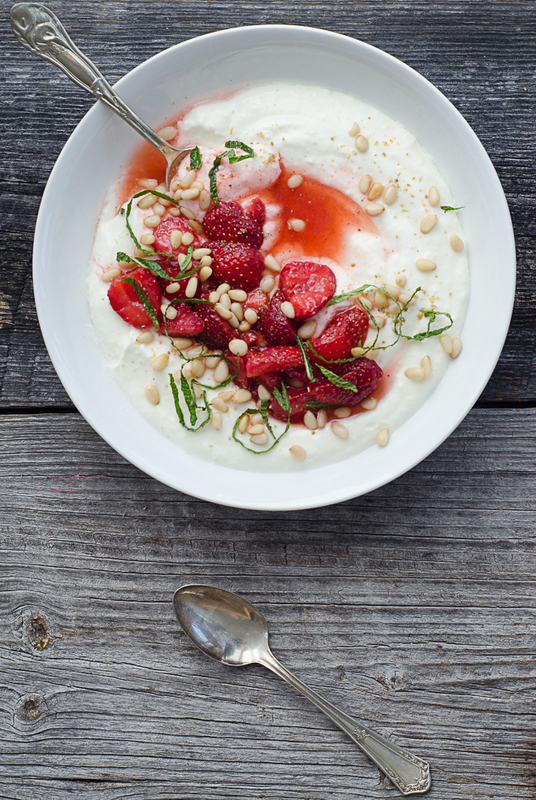 You can keep strawberries in their honey syrup about a five days in the fridge, dipping into them as you need to make your morning yogurt bowl. In folk medicine, bee pollen is used both to combat seasonal allergies and to boost energy. Mind you, I’ve never seen a lick of its effects in combatting my seasonal allergies. And while it has been used in folk medicine for allergies, the research on it remains relatively slim (read more here), some people swear buy it. Bee pollen is, however, rich in vitamins, minerals and rich in protein. It’s particularly rich in B vitamins like thiamin, riboflavin, B6, folate and choline, and it contains trace minerals like sulfur and molybdenum as well as calcium, phosphorus, zinc and magnesium. Bee pollen also contains several food enzymes, just as honey does, including amylase and saccharase which help to break down sugars. Bee pollen offers a dusty, slightly sweet and faintly floral flavor that pairs beautifully with strawberries. You can often find bee pollen through a local apiary or at a health food store. You can order it online, too, by clicking here. Hull the strawberries, and then quarter them. Drop them into mixing bowl. Drizzle the honey over the strawberries, sprinkle in the vanilla bean powder, coriander and fennel, and mix them gently together so that each strawberry is coated in honey. Transfer them to a jar with a tight-fitting lid, and refrigerate them overnight. I don’t often use bee pollen in my cooking, and the sweet faint floral note you describe sounds perfect paired with the other spices. I need to pick up more strawberries to try this out. Thanks for the recipe Jenny. 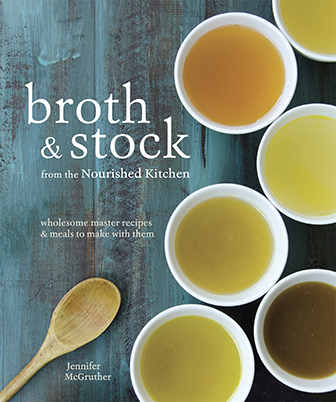 Gorgeous post, Jenny & a happy Summer Solstice to you! I’m curious about bee-pollen — here in Switzerland, many bee-keepers say that in order to receive any benefits from the pollen, you must take it sub-lingually (like a B12 supplement) first thing in the morning, before eating or drinking anything. It’s confusing because so many nutritionally-minded folks (myself included) in the U.S. add to it yogurts, smoothies & the like. Have you (or anyone else out there) heard anything in this vein? Hi Lauren! I don’t think there’s enough (or any) research differentiating between sublingual use of pollen vs. eating it. I don’t imagine that the position of the beekeepers would be born out if there was any research. The only thing I can think of is that many things are absorbed faster subliguinally (like B12 or melatonin supplements) though I’m not certain that’s true of bee pollen. this looks so beautiful and delicious!!! I love how thoroughly written your posts are. It’s great to see that you’re substantiating your claims with evidence, giving people the chance to do their own research, and making sure to specify when evidence is slim about the supposed benefits of a particular food. I don’t know if bee pollen in particular helps my allergies at all, but I do love eating it with my yogurt. I add it to my tea, along with honey and lemon, whenever I get sick. Maybe it doesn’t help, but it makes me feel better, and it certainly doesn’t hurt. I think it would only help with allergies if the pollen included pollens from species to which you’re specifically allergic, and even then, only if you ate sufficient quantities – e.g., if you put it on everything you ate. Most people can’t afford that. 😉 I’ll just keep sprinkling it in my tea and yogurt.